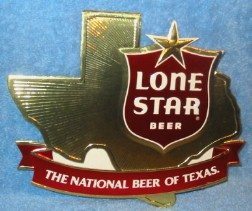 Lone Star Beer – The National Beer of Texas; 9 1/2 x 8 inches, foil over pressed cardboard sign. Nice die cut embossed sign by Embosograph Display. Vintage unknown. Unused, but does have a few soft point and corner areas.